I am pleased to provide a market update for real estate sales on Vero Beach's barrier island. Please call me at (772) 473-7255 with any questions. The real estate market for Vero Beach's barrier island finished strong in 2017, with an overall increase in sold properties by 4%. As we head into Season, you may wish to review these statistics and call me with any questions. 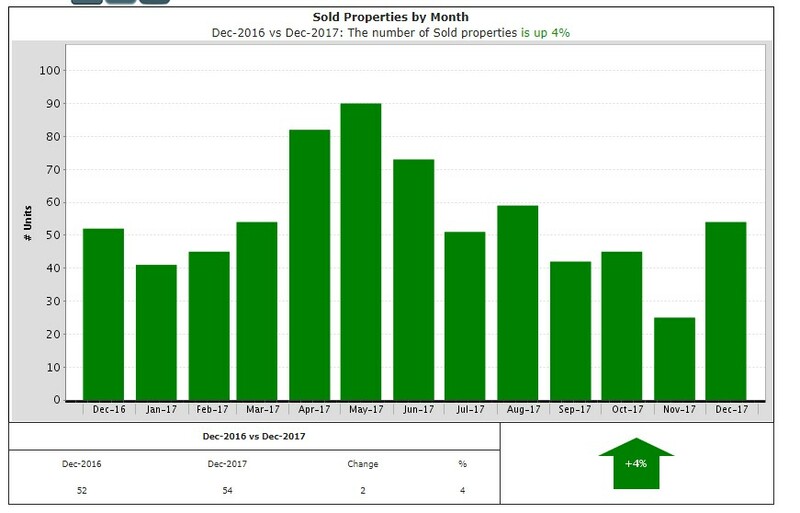 The following graph displays the total number of properties sold in zip code 32963 over the past year. The chart below displays all sales in zip code 32963 in December 2017, broken down by price point. Informed clients are best able to make decisions regarding buying or selling real estate. I am pleased to provide you with a monthly market overview for sales on the barrier island to educate you on the current market snapshot. I welcome your questions and comments and would be happy to assist you with any of your real estate needs. I am only a phone call away. Please call me at (772) 473-7255.